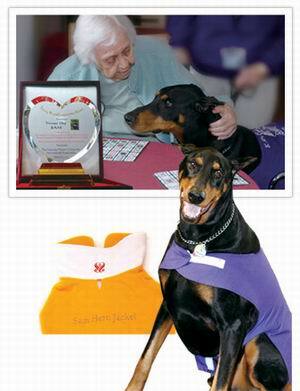 On February 24, Golden Year 5 (2008), members of our Association from the Ohio Center presented the Shining World Compassion Award to Sam, "the therapy dog" from the local K-9's for Compassion group. 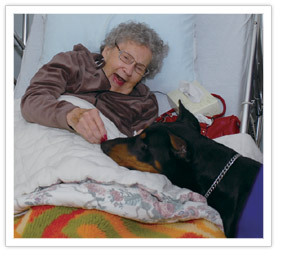 Sam is a Doberman Pinscher who regularly visits hospitals, medical care facilities and senior healthcare centers to bring unconditional love and happiness to the patients. Besides the Award plaque, Sam also received some adorable Happy Doggie Hero Jackets and doggie treats from Supreme Master Ching Hai. His caretakers Mr. and Mrs. Zeller, were given spiritual books such as The Birds in My Life and The Dogs in My Life, and Mr. Zeller expressed interest in becoming a vegetarian. The president of K-9's for Compassion, Katie Costello, said that she was deeply honored to see that Sam had received the award. And Maureen McCarty, Activities Director of the Senior Center Briarfield at the Ridge, thanked Supreme Master Ching Hai for Her love and recognition. We want to express our deep appreciation for Sam's valuable work. May God bless you and all those you help with joy, love and peace.